I used to send dozens of Christmas cards when I was in school. I'd stock up after Christmas when they were discounted over 50% off so I could afford the fancier ones with foil and glitter. They were so pretty; I had to save at least one of each design as a memento. The box of leftover cards is still tucked inside my closet, its contents no less shiny and dazzling from when the plastic packaging was carefully removed. I've pondered letting go of that hoarding tendency and sending them out this year - but what if I accidentally sent one to a friend that had already received it? I may have to research other ways to upcycle them. Any suggestions? What I've been wanting to do the last few years is print my own holiday cards - but I have a difficult time drawing winter themes when it's still warm outside. During December, I usually have so many other things planned that I don't have the motivation to complete a piece in time. My goal this year is to draw an ACEO I can market next holiday season. For inspiration, I flew around Etsy looking for Christmas card sets. 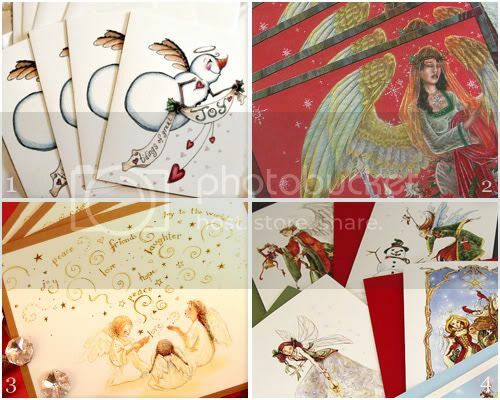 These miraculous Christmas angel illustrations answered my prayer. The snowman angels are so cute! Beautiful mix of cards! I often have cards left over from the year before and have stopped worrying about whether people receive duplicates or not. I also used to send out tons and will be cutting way back this year. I'm still using up some spares, but next year I'd like to make my own. Good luck with your design! Great finds - these are all beautiful cards! These are great finds! I love the snowman angel!